While on the Masons of Texas website I noticed a thread talking about an ancient proclamation, known as the Cyrus Cylinder, is coming to America. This ancient declaration is an ancient clay cylinder, now broken into several fragments, which is written in Akkadian cuneiform script that was discovered in the ruins of Babylon in 1879. 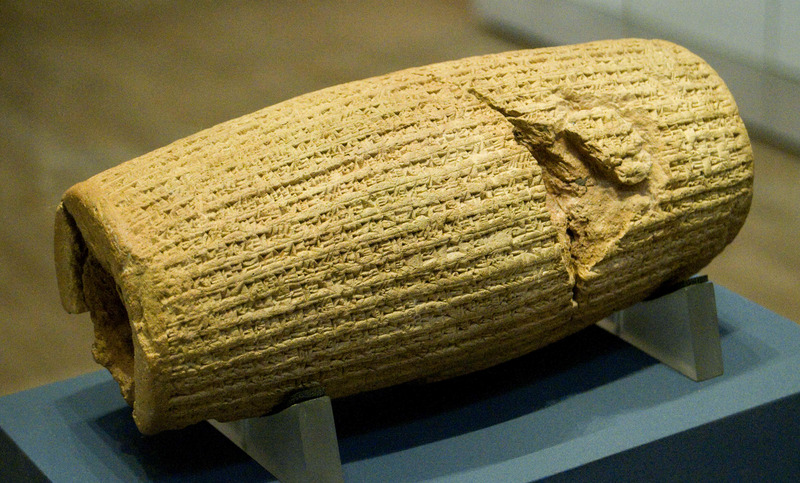 The Cyrus Cylinder is a small unprepossessing barrel-shaped clay cylinder inscribed in enigmatic-looking cuneiform, and yet is one of the most iconic objects in the unparalleled world collection housed at the British Museum. It is an object with many meanings and provides a link to a past that we all share and to a key moment in history that has shaped the world around us. As such it is an object of international significance and is about to start a tour of five major U.S. museums, debuting at the Smithsonian's Arthur M. Sackler Gallery in Washington in March 2013. The tour is supported by the Iran Heritage Foundation. The Cylinder was buried under the walls of Babylon around 539 B.C. after the Persian king Cyrus had captured the city. It describes how Cyrus was able to defeat the Babylonian king Nabonidus with the aid of the Babylonian god Marduk, who had run out of patience with Nabonidus and his shortcomings. Once he had entered the city, Cyrus did not burn it to the ground (as usually happened with conquered cities at this period) but he freed the population from forced labor obligations, sent back to various shrines statues of gods, and allowed the people who had been brought to Babylon by the Babylonian kings to return to their homes. By this act, he was effectively allowing people to pursue unmolested their own religious practices. After it had been buried, the cylinder lay undisturbed for more than 2,400 years until it was dug up in 1879 by a British Museum excavation led by Hormuzd Rassam. When the Babylonian cuneiform was translated, it was immediately realized that the cylinder had a very special significance. Here was corroboration of one of the best-known stories in the Hebrew Bible, the liberation by Cyrus of the Jews deported to Babylon by Nebuchadnezzar and their return to Jerusalem to build the Second Temple. Although the Jews are not mentioned by name in the cylinder, they clearly must have been among the people allowed to return home at this time, with their temple goods. The cylinder also confirmed existing impressions of Cyrus. In the Hebrew Bible he is variously described as the Lord's Shepherd and the Messiah, no doubt largely because of his favorable treatment of the Jews. Not only did he allow them to return to Jerusalem, but he also restituted the temple treasures seized by Nebuchadnezzar and provided royal funds to pay for the rebuilding of the temple. In consequence, Cyrus has been favorably viewed by many Jewish writers, not least in the context of the foundation of the state of Israel. But it is not only in the Bible that Cyrus was revered. The Greek author Xenophon made him the subject of a political romance that seeks to establish the principles of good government, and his book "Cyropaedia" (the Education of Cyrus) is even said to have been consulted by Alexander the Great. I wish I lived on the East Coast so I could go and see this exhibition. The story of King Cyrus and his decrees are central in Royal Arch Masonry as this degree surrounds the story of the Jews return to Jerusalem and the rebuilding of the Second Temple.